In this recipe, the creamy saffron yogurt sauce combined with fresh pita, sweet cherry tomatoes, and cucumbers (I say they're better pickled...) will make you want to hop a plane to the Mediterranean. Greece is by far one of my favorite places to travel. The crisp, white buildings are a refreshing escape from "the real world". That being said, this recipe uses Greek influences to combine the unique flavor of saffron, the tang of Greek yogurt, and the melt-in-your-mouth bite of pita bread. These saffron yogurt sauce pita pockets can be topped with whatever you want --tomatoes, red onion, goat cheese, even pickles (my twist on the Greek cucumber). 1Spray medium saucepan with cooking spray. 3Saute red onions over medium heat and cook until translucent, about 7-8 minutes. 5Add garlic powder and saffron powder. Stir to coat ovens and cook on low for 1-2 minutes. 7Add chicken broth and greek yogurt, stirring well. 9Simmer, uncovered, on low for 20-25 minutes or until liquid has evaporated. 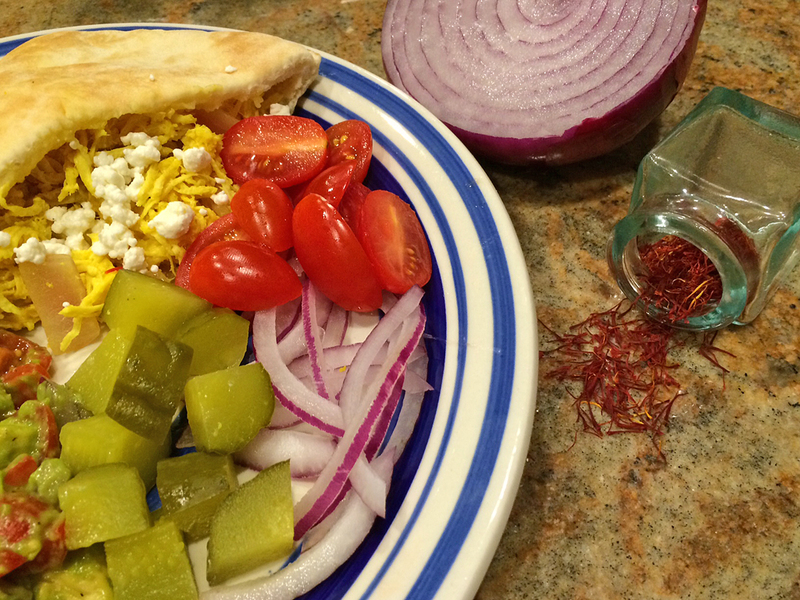 11Let cool and serve inside pita pockets with red onions, tomatoes, pickles, and goat cheese.